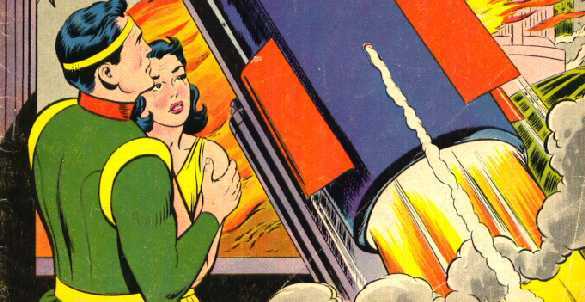 How many women did Superman love in the past? In this page we are going to mention the most important characters in the Superman saga and to get a better clarity we'll do it dividing the page in sections. Albeit we'll mention some characters from the post-Crisis age, we'll mention mainly the classical characters as they are former and less known by the nowadays readers. The planet where Superman was born. Its red sun is the origin of some of the Man of Steel super-powers when is on Earth under the yellow sun. 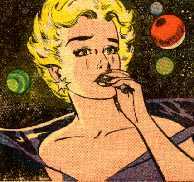 Krypton blew up because internal radiations. First mention in SUPERMAN NO.1 SUMMER 1939. In ACTION COMICS NO.1 it is mention as a distant planet, without any name. Krypton's scientist and the real Superman's father that predicted Krypton's explosion but nobody beleved in him except his wife, saving his son Kal-El sendng him to Earth in an experimental rocket. First appearance in the dailies in January 1939, named Jor-L.
Superman's real mother. First appearance in the dailies in January 1939 , named Lora. Superman's Kryptonian name. First appearance of the name in SUPERMAN NO.113 May 1957. Jor-El's brother. Father of Kara, Superman's cousin more known as Supergirl. First appearance in ACTION COMICS NO.252 May 1959. Zor-El's wife and Kara's mother. First appearance in ACTION COMICS 252 May 1959. Supergirl's Kryptonian name, Superman's cousin. First appearance in ACTION COMICS NO.252 May 1959. A dimensonal plane where the Kryptonian criminals are sent. 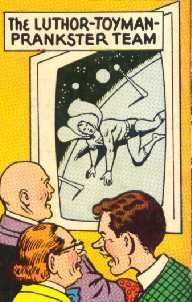 Discovered by Jor-El in ACTION COMICS NO.248 January 1962, but the first appearance of the Phantom Zone was explained in ADVENTURE COMICS NO.283 April 1961. Earlier, the criminals were exiled to outer space slept inside special cartridges (SUPERMAN NO.65 Jul-Aug 1950) when the first Kryptonian villains appeared. A fragment of the planet Krypton that when arrived on Earth in a meteorite form, became deadly to any kryptoniang being. There are several kind of Kryptonite and in several colors but the most dangerous are the green one that can kill Superman and the red one that produces extrange effects on the Man of Steel that last 48 hours. The First appearance of the Kryptonite was in the radio programs of the forties and dissapeared transformed in iron, in the Denny O'Neil's revamp (Denny O'Neil in Spanish), with artists Curt Swan & Murphy Anderson (Curt Swan in Spanish) in 1971. 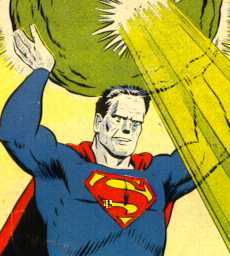 The Kryptonite appeared again in 1986 with John Byrne's revamp of the character. Its first appearance in the comics was in SUPERMAN NO.61 in 1949. Gold Kryptonite: Permanently rob Superman his Super-powers. Blue Kryptonite: Is only toxic to Bizarro creatures. White Kryptonite: Is only harmful to plant life. Superman's Kryptonian love described at the bottom of the page. A little town in Kansas where Superman lived his first years at Earth with his adoptive parents and where he made his exploits as Superboy. In the Novaro edition from Mexico, was translated as "Villachica" or as "Villacalma" in the Muchnick Editores version from Argentina. 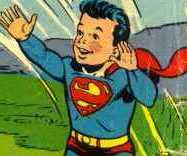 In the first appearance of Superboy in MORE FUN COMICS NO.101, only was mentioned a small town. The name Smallville appears for the first time in SUPERBOY NO.2 from 1949. Superman when he was a boy. 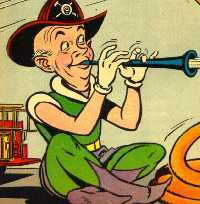 He first appeared in MORE FUN COMICS NO.101 from 1946 and represented an age of about 8 years old. Superman when he was a child at Earth, dressed with his Superboy suit and afterwards as Superman. His first appearance was in SUPERBOY NO.8 from 1950. Superman's adoptive parents who found the baby in the rocket that came from Krypton. 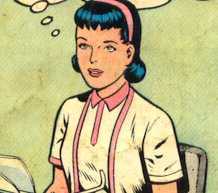 They are mentioned for the frist time as "the Kent" in SUPERMAN NO.1 from 1939 and she is named Mary. (In ACTION COMICS NO.1 it is mentioned that a motorist is getting the baby). 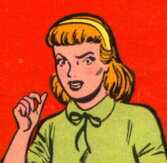 The first appearance of the name Johnattan was in ADVENTURE COMICS NO.149 February 1950 and Marthe the following year in SUPERBOY NO.12 from January-Febraury 1951, changing afterwards to Martha. In the pre-Crisis age, in contrast to the nowadys version, the Superman's adoptive parents are dead and the first time that their dead is told is in SUPERMAN NO.161 from 1963. The name put to Superman by his adoptive parents, that will be his secret identity. First appearance in ACTION COMICS NO.1 June 1938. As the teen Clark in MORE FUN COMICS.101 from 1946. Superboy's friend from his childhood, adolescence and adult life, that suspects Clark Kent and Superboy are the same person. In the Mexican version from Editorial Novaro his name is Lina Luna. 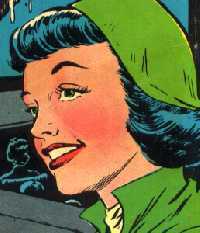 First appearance in September-October from 1950 in SUPERBOY NO.10 in "The Girl in Superboy's Life". Afterwards in SUPERMAN 78/3 from September-October 1952, as an adult woman, move to Metropolis and work in the same Daily Planet (as Clark Kent) and even for a few days she live in Lois Lane's apartment. Lana Lang as adult, will be Lois Lane's rival in get Superman's love, in several adventures. From 1965 will be a TV reporter (SUPERMAN 177/2). 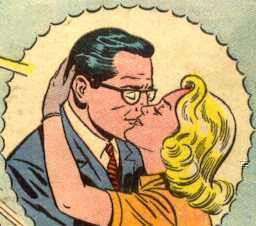 In the post-Crisis version by John Byrne, Lana Lang is Clark Kent's close friend, being the first person who knows his secret identity as Superman. Kal-El's little dog that also survive Krypton's explosion threw to space by Jor-El as an experiment. Superboy's player companion in Smallville. 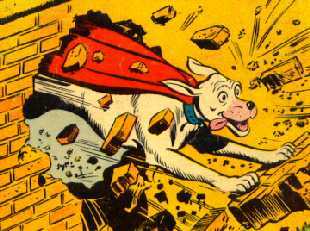 First appearance in ADVENTURE COMICS NO.210 from 1955 (Nowadays one of the most expensive comics because the first appearance of Krypto). Clark Kent's close friend who discovers Superboy's secret identity, although he never reveals it. This is one of the differences between the Superman pre and post Crisis. In the post-Crisis era Lana Lang is the one who knows Superman's secret identity revealed by himself. First appearance in SUPERBOY NO.86 from 1961. The city where the adult Superman lives and works. First appearance in ACTION COMICS NO.1 June 1938. Name of the newspaper where the adult Clark Kent works. At the begining it was named as the Daily Star, changed without explanation to the Daily Planet in ACTION COMICS NO.23 April 1940 in the first picture of the story. Mild-mannered reporter who is secretely Superman. Clark Kent has been usualy timid except in these medias: 1. In the version of John Byrne, 2. In the 104 TV episodes starred by George Reeves, 3. In the 26 fist TV episodes of the adventures of Superboy starred by James Haymes Newton, 4. In the TV serie 'Lois & Clark. The New Adventures of Superman'. In the 1971 Denny O'Neil's revamp of the character, begining in SUPERMAN NO.233, Clark Kent left the Daily Planet and began his career as TV anchorman in the Galaxy Broadcasting Corporation to WGBS TV NEWS. Daily Planet reporter. Superman's girl friend. In many adventures he suspects that Clark Kent is Superman albeit she never can prove it. In the post-Crisis era, Superman reveals to her his secret identity and finally get married. First appearance in ACTION COMICS NO.1 June 1938. It was the second character that got his own collection: SUPERMAN'S GIRL FRIEND LOIS LANE. 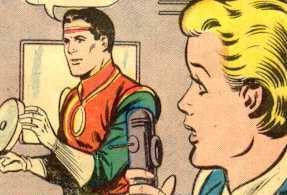 Office boy, photographer and reporter for the Daily PLanet (in the pre-Crisis era). Friend of Superman, whow gave him an ultra-signal watch to call the Man of Steel in every danger situation. First appearance in the radio serials of the forties and in the comics in ACTION COMICS NO.6 1938 as 'office boy', afterwards in SUPERMAN NO.13/2 Nov-Dec 1941, as "Jimmy, the Office-boy", and with the complete name in SUPERMAN NO.15/1 Mar-Apr 1942. 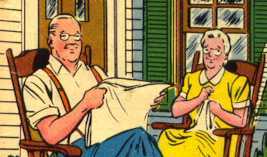 (First minor character that got his own collection: SUPERMAN'S PAL JIMMY OLSEN en 1954). Alternate identity used by Jimmy Olsen when he drinks the elsticity serum. 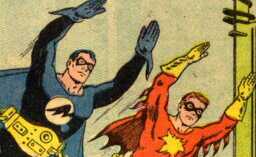 As Elastic Lad is honorific member of the Legion of Super-Heroes. First appearance in JIMMY OLSEN NO.31 1958. Director and Chief of the Daily PLanet, friend of Superman. First appearance as Mr. White in SUPERMAN NO.7/1 November-December 1940 and with the name of Perry White in SUPERMAN NO.10/2 in May-June 1943. Lois Lane' sister and Jimmy Olsen's girl friend. 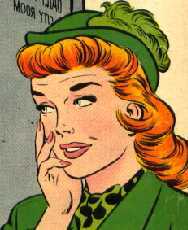 From her first appearance in SUPERMAN'S PAL JIMMY OLSEN 36/2, in the adventure entitled "Lois Lane's Sister", Jimmy ask Lucy to get married, but Lucy's answer is that she cannot be married until her sister Lois be married too, and adds: "If you gain Superman get married to Lois, then I'll be married to you". The Chief of the Galaxy Braodcasting Corporation. He is also Clark Kent's chief from SUPERMAN NO.233. He is under the orders of Darkseid and the two of them have their first appearance in SUPERMAN'S PAL JIMMY OLSEN NO.134 in 1970. (second issue of the Jack Kirby's Fourth World saga in the collection SUPERMAN'S PAL JIMMY OLSEN). Clark Kent's companion in the Galaxy as sportman reporter. He is always trying to joke Clark Kent, but he always fails as he does not know that Clark is secretely Superman. First appearance in SUPERMAN NO.264 in 1973. Lana Lang's uncle, Superman's friend and inventor of strange apparatus that sometimes have provided super-powers to Lois Lane or Jimmy Olsen. Metropolis neighborhood where the orphanage of the same name is and where lives Superman's cousin Linda Lee, the secret identity of Supergirl. First arppearance in ACTION COMICS NO.252 May 1959. Name of the Supergirl's secret identity. Supergirl's secret identity name after be adopted by the Danver family. Superman's cousin. She comes from Argo City. A great piece of Krypton was thrown to outer space containing an enter city, saving all its inhabitants from the doom planet, albeit later a meteor rain destroyed the city, but before that, Zor-El and Alura sent their daughter to Earth where they knew was living her cousin Kal-El. First appearance in ACTION COMICS NO.252 in May 1959. Many more data in the Supergirl pages. Lex Luthor's sister and Linda Lee's friend. First appearance in SUPERMAN'S GIRL FRIEND LOIS LANE NO.23 in 1961. Friends and companions of multiples adventures teaming up with Superman. Their first team-up adventure was in the radio programs in the Forties. 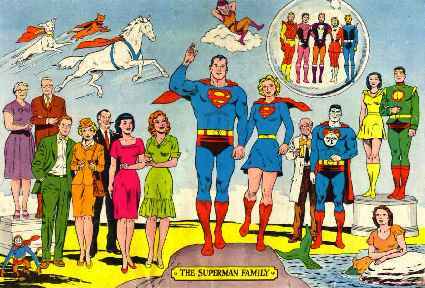 In the comics, their first together adventure took place in SUPERMAN 76/1 May-June 1952. (Another of the most expensive comics for this motiv). Superman's imperfect double because of a mistake in an experiment. Thinks and feels the contray of the normal situations. First appearance in SUPERBOY NO.68 in 1958 and as an adult in ACTION COMICS NO.254 July 1959. Bizarro's wife and Lois Lane's imperfect double. First appearance in ACTION COMICS NO.255 in Augost 1959. Secret place in the Artic, where Superman has his trophies, memories, his friends' particular museum, robots, and so on. Along the multiples adventures of the Man of Steel, always it's been spoken about a secret place with different names. The first time that this name was used ('Fortress of Solitude") was in SUPERMAN NO.58/3 in May-June 1949, and it was in a place full of snow and ice, withou saying that was in the Artic. It will last 9 years until this name be used again and this time it is clearly ubicated in the Artic in ACTION COMICS NO.241 in June 1958. In the post-Crisis version, we'll see again the Fortress of Solitude (see below ERRADICATOR in the enemies' section). 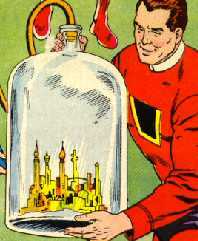 A Kryptonian city miniaturized and placed in a bottle by the villain Brainiac, an extraterrestrial being at the begining, afterwards a human super-computer, before Krypton exploted. Superman gets to rescue the bottle from the Brainiac space craft, albeit he does not get to return it to its original size. The bottle is placed in the Fortress of Solitude, passing a lot of years until he get to return it to its normal size. First appearance in ACTION COMICS NO.242 in July 1958. Emergency patrol formed by several Kandor inhabitants that wear the same Superman costume and that from time to time get out of the Kandor bottle in order to help his friend Superman. First appearance in SUPERMAN'S PAL JIMMY OLSEN NO.48 in 1960. Jimmy Olsen and Superman with different costumes in adventures that take place inside the bottle city of Kandor. 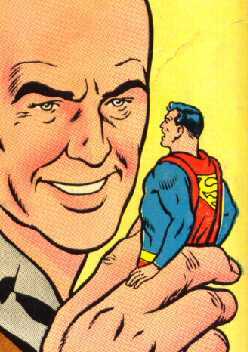 First appearance in SUPERMAN NO.158 in 1963. Newspaperwoman that works in the Daily Planet and starts to like Clark Kent, although she is not corresponded. Afterwards she will be Jimmy Olsen's friend and finalyy with Jose Delgado (aka Gangbuster) working under the orders of Morgan Edge for the television. First appearance in ADVENTURES OF SUPERMAN NO.424 in January 1987. Extraordinary scientist and inventor that works freelance and becomes Superman's friend helping him in numerous ocassions. First appearance in ADVENTURES OF SUPERMAN NO.424 in January 1987. Metropolis veteran police, friend of Clark Kent. First appearance in the radio programs of the Forties. He is also in the TV series starred by George Reeves in the 1950's. 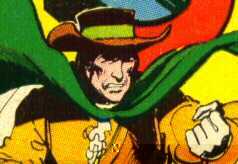 First appearance in the comics in ADVENTURES OF SUPERMAN NO.424 in January 1987. Police's chief of the Special Crimes Unit in Metropolis and Superman's friend. First appearance in SUPERMAN NO.15 in March 1988. 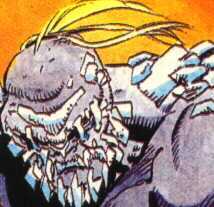 Mad scientist, enemy of Superman that appears in the first issues of the saga. He is bald, in an age that Luthor has red hair. First appearance in ACTION COMICS NO.13 in June 1939. Superman enemy that makes his crimes with jokes. In the Novaro version he is known as "El Bromista". First appearance in ACTION COMICS NO.51 in August 1942. Superman enemy that makes his crimes using toys. In the Novaro version he is known as "El Juguetero". First appearance in ACTION COMICS NO.64 in September 1943. Luthor thinks that if there is a Legion of Super-Heroes in the future, there also must be a Legion of Super-Villains and traveling to the future he finds that it is true. They are Cosmic King, Lightning Lord and Saturn Queen. The four villains agree in eliminating Superman but they cannot do it. First appearance in SUPERMAN 147/3 in August 1961. Fifth dimensional imp that comes to the Earth every 90 days causing all kind of problems to Superman, until he is able to return it to his dimension making that the imp pronunces his name backwards, the only way to get over him. First appearance in SUPERMAN NO.30/1 in September-October 1944. In the last picture of the adventure, the editorial ask the readers that if they want to see more Mr. Mxyzptlk adventures, send a postacard. The "TP" of his name became "PT" in SUPERMAN NO 131/1 in August 1959. Of all Superman's enemies, becomes the worst at the end of the pre-Crisis era, killing some of the best Superman's friends, and almost kills the Man of Steel (ACTION COMICS NO.583 and SUPERMAN NO.423 in 1986, reprinted in oneshot issue recently). The second worse enemy of Superman after Luthor. In fact, in many occasions, Lex Luthor and Brainiac are associated to kill Superman. First appearance in ACTION COMICS NO.242 in July 1958 when miniaturice an entire city, among others, the Kryptonian city of Kandor. In the post-Crisis version appears again in ADVENTURES OF SUPERMAN NO.438. At the begining is an extraterrestrial, afterwards a human super-computer created by the tiran inhabitants of the planet Colu, in their trying to conquer the universe. The new Brainiac in the post-Crisis era is different as at the begining is the union between hte body of a person with some mental powers, with the consciencie of the dead Vril Dox, a scientist of the planet Colu. 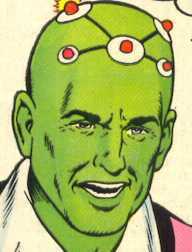 Afterwards, with the help of Luthor, Brainiac will get a replica of his original Coluan body. A robot-man, enemy of Superman. His heart is maintains alive with a piece of green Kryptonite and this is why he becomes a great danger to the Man of Steel. First appearance in SUPERBOY NO.49 in 1956. At the begining a chimpanzee of a zoo named Toto. Sent in a satellite that collides with two radioactive metorites, one of uranium and another of Kryptonite. 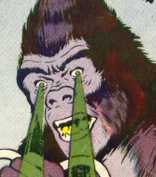 When he returns to Earth is transformed in a gigantic ape that emit Kryptonite radiations. Because of a strange fixation, he is docile with Lois Lane. First appearance in SUPERMAN NO.127 in February 1959. Character that absorbs the energies of the human beings, even the one from Superman. First appearance in ACTION COMICS NO.340 in August 1966. A child sun of a Western era outlaw that is kidnapped by an extraterrestrial and educatedas a criminal from outer spaceo. He looks like a Western gunman. First appearance in SUPERMAN NO.249 in March 1972. Extraterrestrial of the planet Valeron, that at the begining is a Superman enemy, but later becomes friends. Valeron blows uo, like Krypton and Vartox came to Earth where Superman gave him a secret identity, having a romance with Lana Lang that ended bad and because of that Vartox finally left the planet Earth looking for another world to live in and use his super-powers. 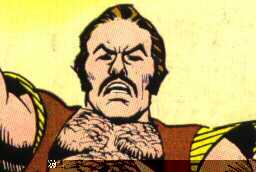 First appearance in SUPERMAN NO.281 in November 1974. Extraterrestrial woman from the planet Almerac, looking for an appropiate husband for her faculties, falling in love with Superman and coming to Earth looking for him, but she does not get her intentions. In one of the possibles futurs of Superman, they become friends after the death of Lois Lane and finally she lives on Earth joining the Justice League of America. First appearance in ACTION COMICS NO.651 in March 1990. Kryptonian device that survives the explosion of the planet Krypton that comes to the Superman hands. When the Man of Steel realizes that is very dangerous, he through it to the Antartic ices. The device, that was programed in Krypton to recreate the environment of that planet, it builds the Fortress of Solitude of this new era and continue trying to transform the Earth in a Krypton duplicate. In its trying, transforms Superman in a though Kryptonian personality (Krypton Man), but fails as puts in danger the adoptives parents of Superman, he throws the Erradicator to the Sun in order to destroy it permanently. However, the Erradicator survives getting the form of a human being named Krypton Man and transforming in a new enemy. First appearance in ACTION COMICS ANNUAL NO.2 of the Byrne era. Brutal creature that destroys everything and a being you cannot reason with. He is the apparent reason of the Superman death (several editions. Text in Spanish), in a great battle in wich both of them apparently die. (SUPERMAN NO.75 in January 1993). First appearance in SUPERMAN: THE MAN OF STEEL 17 November 1992. (Yet mentioned. 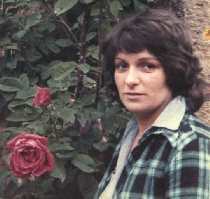 Here we can see her in her adult version). Kryptonian movie star that Superman knows in a time traveling to Krypton. The two of them fall in love and live an intense romance. In this adventure, Superman lives with his parents Jor-El and Lara and have no powers as he is on Krypton. At the end he cannot avoid Krypton's doom and he is the only one who can go on living, returning to Earth keeping the memories. This was a three part story appeared in SUPERMAN NO.141 in November 1960 reprinted in SUPERMAN NO.232 January 1971 returning in other adventures as Superman's memories. Millinaire rancher's daughter that meets Clark Kent who has lost his memory because of the Red Kyptonite effects, and named now Jim White. 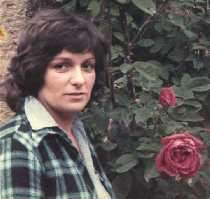 Jim (Clark) falls in love with Sally and begins to work in the ranch. A courting boy of Sally, jealously, throws Clark by a precipice, falling into a river and later got by Aquaman and carried to Atlantis where thanks to Lori Lemaris, recover his memory except all of his living with Sally Sellwyn. 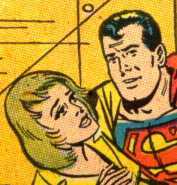 This adventure published in SUPERMAN NO.165/3 in November 1963, was a great succeed because of its emotiveness, and as the readers asked for a continuation, 4 issues later we saw Sally again in SUPERMAN NO.169/2 in May 1964, where Clark meets Sally again and when kissing her he recovers the memory of everything that happened between them and decided to marry her. However he later has to renounce to his plan as he thinks that if he marries her Sally wil be in danger. Hopeless, he goes to outer space regreting his impossibility of be happy. Mermaid of Atlantis who met Clark Kent in his university years. As Lori has telepathy she discovers Superman's secret identity. Superman falls in love with her and later being severely wounded he looks for a way to cure her finding in another planet a surgery Merboy who Superman carries to Earth. The Merboy cures Lori but she falls in love with him and she tells Superman that his emotions are not love but compassion. First appearance in SUPERMAN NO.129/3 in Mayo 1959. Movie actress that Superman falls in love with, deciding to marry her revealing his secret identity. However, Lyrica falls severely ill and dies. SUPERMAN NO.196/2 in Mayo 1967. Supergirl search several women in order his cousin Superman do not be alone. After several failures she finds in a distant planet a superwoman very similar to herself, but when she comes to Earth the yellow sun rays are deadly to her and she must return to his planet. First appearance in ACTION COMICS NO.289/2 in June 1962. 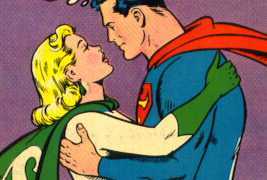 These are the classic Superman's romances that if we order cronologicaly will be in that way: first Lois Lane, second Lana Lang, third Lori Lemaris, fourth Lyla Lerrol, fifth Luma Lynai, sixth Sally Sellwin and seventh Lyrica Lloyd. They are seven and her names begin by "L" except Sally Sellwin who carries four.